^ Henry Pelling, The Origins of the Labour Party. London: Macmillan, 1954. Page ??. ^ David Howell, British Workers and the Independent Labour, 1888-1906. Manchester: Manchester University Press, 1984. Pages 471-484. ^ Howell, British Workers and the Independent Labour Party, pp. 301-327. ^ Dowse, Left in the Centre, pp. 6-7. ^ Fenner Brockway, Inside the Left. London: Allen and Unwin, 1942; page 24. Cited in John Callaghan, Socialism in Britain Since 1884. Oxford: Basil Blackwell, 1990; page 67. ^ Brockway, Inside the Left, pg. 24, cited in Callaghan, Socialism in Britain, pp. 66-67. ^ Callaghan, Socialism in Britain, pg. 67. ^ Joseph Clayton, The Rise and Decline of Socialism in Great Britain, 1884-1924. London: Faber and Gwyer, 1926; pg. 165. ^ Clayton, The Rise and Decline of Socialism in Great Britain, pg. 165. ^ Clayton, The Rise and Decline of Socialism in Great Britain, pg. 166. ^ a b c Clayton, The Rise and Decline of Socialism in Great Britain, pg. 167. ^ Adam Hochschild (2011). To End All Wars - a story of loyalty and rebellion, 1914-1918. Boston New York: Mariner Books, Houghton Mifflin Harcourt. pp. 274. ISBN 978-0-547-75031-6. ^ R.C. Wallhead and Clifford Allen, "Letter to ECCI," 21 May 1920. 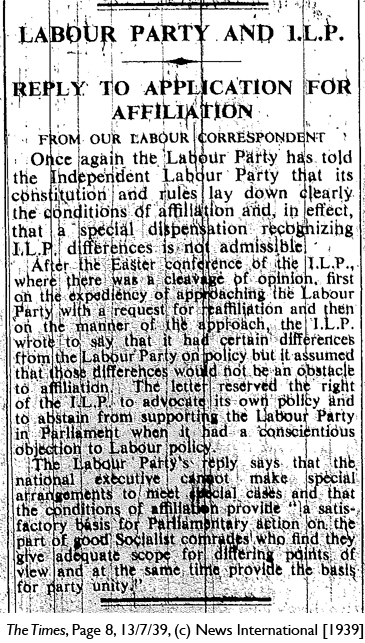 Reprinted in Left Wing Group of the ILP, Moscow's Reply to the ILP: The Reply of the EC of the Communist International to the Questions of the British ILP, together with an Appeal to the Communists Inside the Party. Glasgow: H.C. Glass for the Left Wing Group of the ILP, July 1920. Pages 2-3. ^ Moscow's Reply to the ILP," pg. 6. ^ Moscow's Reply to the ILP," pp. 31-32. ^ Joseph Clayton, The Rise and Decline of Socialism in Great Britain, 1884-1924. London: Faber and Gwyer, 1926. Page 179. Robert E. Dowse, Left in the Centre: The Independent Labour Party, 1893-1940. London: Longmans, 1966. David Howell, British Workers and the Independent Labour Party, 1888-1906. Manchester: Manchester University Press, 1983. David Howell, MacDonald's Party: Labour Identities and Crisis 1922-1931. Oxford University Press, 2007. Alan McKinlay and R.J. Morris (editors), The ILP on Clydeside, 1893-1932: From Foundation to Disintegration. Manchester: Manchester University Press, 1991.